Mileage is definitely down from year. This is partly due to fewer commutes but also to adding a race, Apostile Islands, this year. It is weird that racing reduces mileage but it always works out that way. Heart rate is down so maybe I need to kick it up a notch. Or maybe the number is just bogus. The battery in the HRM was fading throughout the month and actually died during the last week. I have another race this month. I'm taking a chance on Chicago. I hope the tar snakes don't bite. 654 miles! That's pretty intense. Do you think June was unusual or it is that par for the course when all mileage is included? A combination of things really. First of all, historically, I OWN June. The days are finally long enough so I can put in skate sessions before and after work if I choose, or at least one of the sessions if rain messes me up. And work slows down so i can work minimum hours. By July and August it's just too hot. So it's June or BUST. My last chance until October really. So, knowing June is MY MONTH, I decided to skate every day rain or shine and hoped to skate 10 miles each day. I exceeded that slightly. Yes, anything over 300 miles skating is a fantastic skate month for me. Adding the commute and utilitarian miles alone gives me 200 or so bike miles every month. I also added a couple decent pleasure rides in June. Stuck with it and no serious injuries. Put off every home project I could as well. So that's it. Thanks for asking! One good footnote: My 256 miles of roller skating was on QUAD skates! The other 70 "skate" miles were skateboard sessions. Have not touched the inlines in about three months. Just enjoying the old school roll right now. And quads grip so much better on wet surfaces than inlines. 1 -2 mph slower though. No biggie. 70.22 miles of skating, 300 overall including bike/hike/ whatever. 212 just my bike commute. Sore heel kept me off the skateboards. Heat/rain limited everything else. Eh. Not every month can be awesome. I thought I had a pretty solid month. But looking at last year's stats, I'm not so sure. Average heart rate and speed are down. This may be due to the lack of group training sessions. This year's race, Chicagoland was also slower than last year's Barbary Coast. Pretty miserable, actually. My slowest marathon ever. That's what happens when you mislabel an obstacle course as speed event and then it rains. Peek distance, at least, is up noticeably. I'm doing A2A this year so I snuck in a 100K on the last Sunday of the month. Another one at faster pace just two days ago. But that will go on August ledger. August might have relatively better numbers since I'm doing Grand Forks again. Last year's eclipse was very cool but it did nothing for my skating stats. 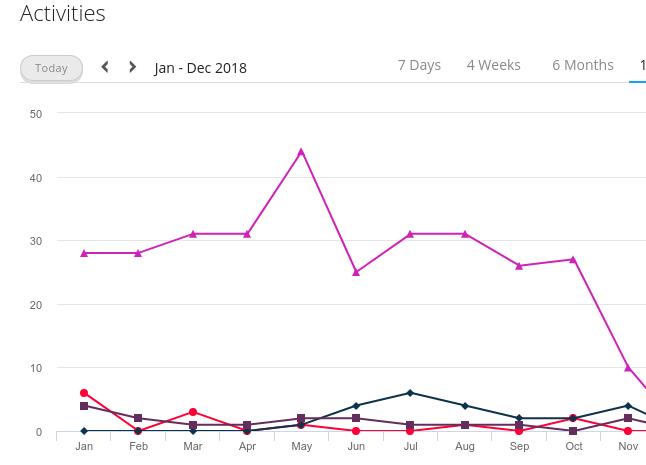 Numbers are down a little from last year. This is a little surprising since I swapped a relatively sedentary eclipse trip for a race and I snuck in a 100K training skate. One thing that is very different is heat. Summer of 2017 got seriously hot several times. Despite the high temperatures in the fire zones, the Bay Area has been surprisingly temperate. I'm actually a little concerned. I'm doing A2A this year. Low temperatures have made it easier for me to fit in long skates (72 miles yesterday) as my hydration needs can be met with a single 3L Camelbak. The downside is that Georgia gets hot, I may not be as ready. September should be exciting as I have not one, but two races. Back to back weekends, even. Duluth on 15th and New York 100K on the 22nd. July and August both under 100 miles for me. August I got 81.8 miles of combined skating. I don't track my cycling but just my commute is 200 miles/month. Weather killed me in July. Sore heel issue AND bad weather made me decide to seek physical therapy while the heat or rain was keeping me sidelined anyway. Halfway through 10 PT sessions and heel is feeling better. Should be up and skating before the first cool front. Job search is also crimping my style. This will continue through September. So will hurricane season. October is my target for health. Ouch. I'm curious, what sort of PT do you do for sore heal? Job search would crimp anyone's style. Are you currently working? Hurt my heel pushing a skateboard that was too high for too many miles and too many days. Then kept doing it for a couple months after it was injured. It was Spring and the weather was perfect so I kept on. Tried to heal it myself for several months but failed. Always went away with care in the past. Not this time. Getting old. 1. 15 minute foot Jacuzzi. Foot submerged with hot water jet directed at arch and heel. 2. Deep tissue massage of calf, ankle, heel, and arch. HURTS! 3. Dry needles in heel with mild electric current. Feels pretty good. Like someone gently hammering the bottom of my heel. 4. Four different calf and arch stretching exercises on machines and trampoline. 5. 20 minutes of ice. If you have any miracle cures, let me know! Yes, I have a job currently. Needing a change. Something with benefits. My heath insurance premiums are outrageous and my deductible is high. I can't say I understand the comparison with last year so maybe I shouldn't bother. Distance is about the same. Speed is somehow lower. Anyway, this was a busy month, with two races. Northshore was fast but not as fast as it could have been given the tail wind. NY100K was rather slow in part because I was fighting a sinus infection on race day. Ugh. I do hate when there are health hickups during prime race season. A few years back, I raced Grand Forks with shingles. I didn't know it at the time but it messed up my training for a couple of weeks after. I still haven't quite kicked the sinus infection. It needs to be gone well before A2A. August and early September were really hot so I took that opportunity to address some plantar fasciitis in my left heel (my skateboard push foot) that had gotten progressively worse since March. Ten sessions of physical therapy did wonders. It isn't perfect but much improved so I am skating but taking it easy. Almost zero skating during September. Got 70 miles first week of October combo skates and boards. Weather is finally improving and cooling down. Hopefully the heel will hold up through out mild winters when the weather is perfect for skating. 93 miles of skating for October. I was surprised to see that number as I haven't skated but once in the last three weeks. 93 miles skating. Just commuting gives me 200 miles every month on the bike. Probably about 200 bonus miles at least. I did one longer ride of 50 miles as well. I've given up comparing year over year. I'm just not that consistent from year to year and I can't remember all the details from that far back. Lowest monthly mileage in two years, though still much better than October 2016 which was a moving time disaster. I tapered before A2A, skated little after A2A except for the race in Tucson race and the vegged another week for a "proper" recovery. I did manage to kick the sinus infection before A2A. Curiously, the max speed is not from A2A. It was me and one other guy inline at the usual Wednesday night hill. I didn't manage to do a full bomb on Silver Hill and the earlier hills were slower than prior years. I think the pavement at A2A was noticeably rougher this year. It was a good race though. I finally held onto a paceline all the way to the end. Best time in ten years. I will post the race report soon. Due to terrible weather, minor injury to my heel, lack of daylight, tree debris from frequent storms, and a continuing job search I have only skated twice in the past 6 weeks. I have basically given up and returned to cycling as my only recourse. Therefore...I will be absent from this place as a participant until conditions return to favorable. Not likely to even get 2000 miles this year. Bummer. I get an email notification from this thread, so I will be looking in and cheering all of you on. (All ONE of you). 7 skate sessions in November for 38 miles. 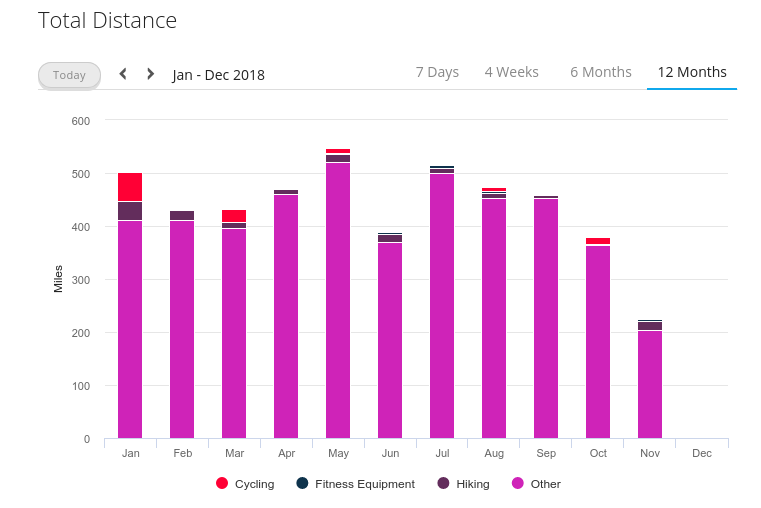 As stated last month, I switched back to cycling but do not track cycling. Still tons of tree debris most places and short daylight hours have curtailed my skating. Lowest monthly mileage in two years, though still much better than October 2016 which was a moving time disaster. October may have been off but November was a full on disaster: least active month on record and that includes the moving mess of October 2016. I started off the month battling a virus. I took off skating for several days to cope with that. I even skipped the Wednesday Night skate. Just as I was starting to feel capable again, the Camp Fire erupted incinerating the town of Paradise and blanketing much of the rest of California in toxic smoke. I managed one Friday Night Skate and a sub-scale Sunday workout both with just-passable air conditions before it all went Red. For the next ten days everything ground to a halt. There were no weekend hikes. There were no Wednesday or Friday Night Skates. I did not bike or skate to work. Even the inside air was getting bad. My Sunday "workout" consisted of walking around the interior of Great Mall three times. We were finally saved by rain, the first in several months. It cleaned the air and mostly put out the fire, allow us to breath freely again. Unfortunately, it didn't make for good skating conditions. Two Wednesday Night Skates and one Friday were washed out. I managed two weekend workouts on consecutive days and one skate commute, right at the end. In both cases, I could feel the decline in my fitness. December is usually a low month and more rain is expected. Still, it should be better than November. It could scarcely be worse. Quads and inline skates don't bother the foot. Still leery about pushing a skateboard though. Injury could take six months to a year to heal. I am about 4 months into the healing now. Do NOT want to start over. Playing it really safe. 56 skating miles for December. No typo. FIFTY SIX. Yep. Sinus/chest crud for two solid weeks, but no matter. Weather sucked for skating anyway. Maybe 130 cycling miles strictly commuting for December. I did skate to work one day, then biked back home after dark. Cycling = I don't track it. Just commuting = 1500 or so miles if I like it or not. 2017 skating was 3077 miles. I will never beat that unless I win the Lotto and quit my job. (I don't play the Lotto BTW). 2018 started off awesome, skating to work almost every day for two months. Weather and injury killed me after June. Hope the weather pattern improves but with the changing climate I believe my area is becoming a rain forest. A little drought would be in order.